Dr. Ronald Trible grew up outside of Baltimore, Maryland where most of his family still resides. He received a biochemistry degree at the University of Maryland at College Park in 1997. He then spent two years as a pre-doctoral research fellow at the National Institutes of Health in Bethesda, MD, where he studied the molecular mechanisms of a T lymphocyte protein called LAT (linker for activation of T cells). He then attended a combined MD/PhD program at the University of Pittsburgh, earning a Ph.D. in biochemistry and molecular genetics in 2006 and an M.D. in 2008. While at Pittsburgh, he completed his thesis entitled “Effect of the HIV-1 Nef Protein on SRC Family Kinases”, which details then newly-discovered biochemical interactions of the HIV-1 Nef protein with key kinase molecules within human cells. He then moved to Atlanta to complete his internal medicine residency and infectious diseases fellowship at Emory University. While at Emory he spent 3 years studying a novel therapeutic HIV treatment strategy utilizing neutralizing antibodies that has shown promise in both animal and human trials. He joined Georgia Infectious Diseases in 2014 and, in addition to seeing patients both in clinic and at Emory St. Joseph’s Hospital and Northside Hospital, he serves as Medical Director for the Antimicrobial Stewardship Program at Emory St. Joseph’s Hospital. Dr. Trible has particular interests in: HIV and STDs, hepatitis C, recurrent UTIs, mycobacterial diseases (including TB and MAC), C difficile, and helping to prevent infections related to biologics and other immunosuppressive treatments. 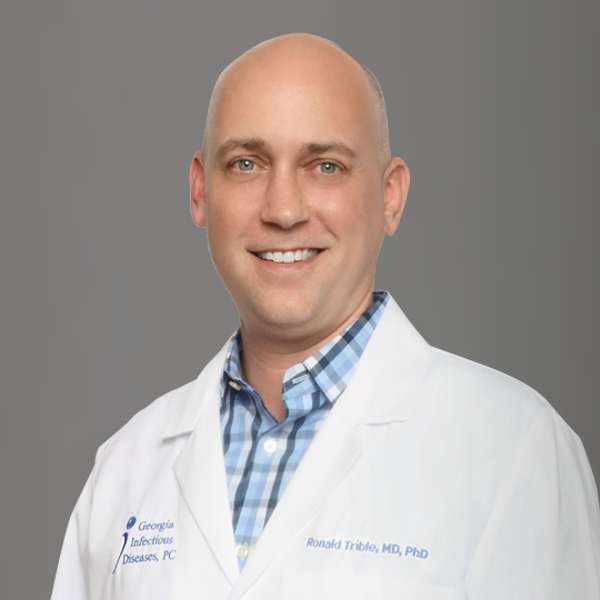 When not working, Dr. Trible enjoys traveling to and photographing international destinations, playing softball, spoiling his niece and nephew, and following the Pittsburgh Penguins, Baltimore Orioles, Baltimore Ravens, and Atlanta United. He resides in Midtown, Atlanta. Note: If you have a life threatening medical emergency, please call 911.